Blue topaz engagement ring with Sleeping Beauty turquoise inlay. Unique topaz and turquoise engagement ring inlaid with bright blue turquoise. The 1 carat trillion Swiss blue topaz looks great accented by the Sleeping Beauty turquoise inlaid down the sides of the ring. 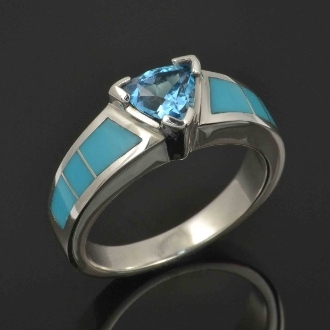 If you are looking for a unique wedding or engagement ring with some personality, this turquoise ring is for you. The ring is a medium width and measures 7mm at its widest point and tapers down to about 3mm at the bottom. It will take about 4 to 6 weeks for us to make this ring in your specific ring size. If you would like a matching band (style #W134) to be worn next to this ring, I can make it for you in 4 to 6 weeks. Inlay options: opal, lapis, onyx, gem silica, dinosaur bone, turquoise, lab opal & more!